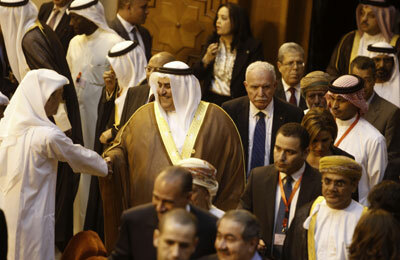 Arab foreign ministers arrive for the meeting. Arab states on Sunday urged the international community to take action against the Syrian government over a chemical gas attack that killed hundreds of civilians. The final resolution passed by an Arab League meeting in Cairo urged the United Nations and international community to "take the deterrent and necessary measures against the culprits of this crime that the Syrian regime bears responsibility for". The US had seemed to be gearing up for a strike against President Bashar al-Assad's forces over an Aug 21 poison gas attack, but is now seeking Congressional approval first. President Barack Obama's decision to delay military action to seek Congressional support could delay a strike by at least 10 days, if it comes at all. Syria's neighbours Lebanon and Iraq, as well as Algeria, all declined to back the text, as they have done with similar resolutions in the past. Syria itself is suspended from the League.